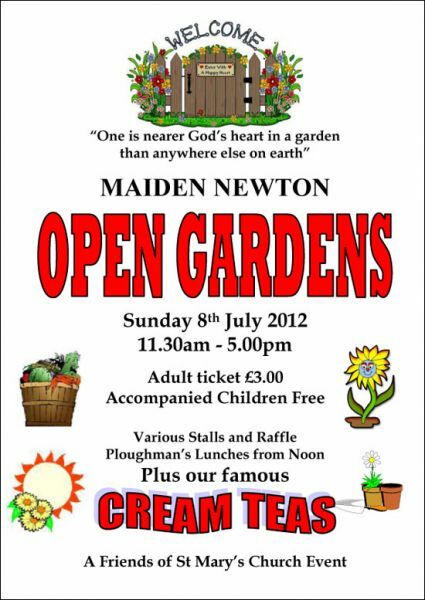 Maiden Newton Open Gardens features again this year on Sunday 8th July 2012. Open from 11.30am - 5.00pm, adult tickets cost just £3.00 (accompanied children free) with all proceeds going towards St Mary's Church. As ever, there will be various stalls and a raffle on offer, with Ploughmans lunches being served from noon. Plus, their famous Cream Teas! There will also be chance to go on a tour of the newly refurbished church, having now been repaired after the fire damage from March 2011 (see seperate story).